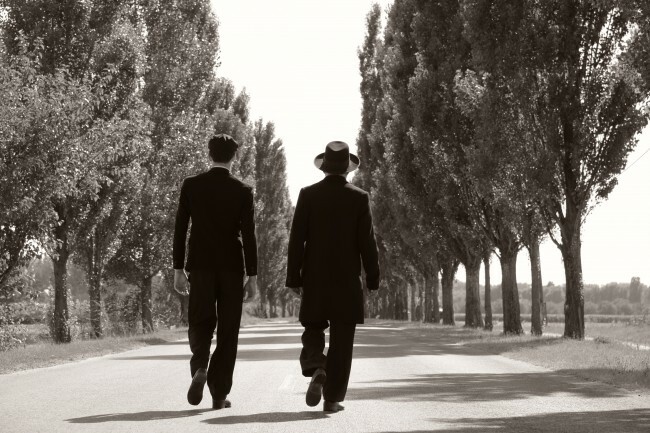 At the beginning of 1945, not a Holocaust film so much as a post-Holocaust film, two Orthodox Jews clad in black suits arrive in a small Hungarian village on a swelteringly hot day in mid-August, 1945, shortly after World War II has ended in Europe. None of the townsfolk has seen a Jew since all the local Jews were deported to concentration camps the year before, and no one recognizes these two men, who carry wooden crates they claim to contain perfumes and cosmetics. It’s 11am; the strangers will reach town by noon. The news travels like wildfire, and soon the villagers are hunkering down in their homes and businesses, furtively peering out the windows, anxiously awaiting a glimpse of the mysterious, unwelcome visitors who could well be set on revenge. 1945 was a sensation when it debuted in the Panorama section of the Berlin International Film Festival in 2017 and won awards on the festival circuit, including Best Feature at the Jerusalem Film Festival, as well as several audience nods. If you haven’t heard of Ferenc Török (this is his seventh film), you likely will very soon. The brilliant young filmmaker, who turns 47 this month and is not Jewish, cowrote the screenplay with his Jewish friend and Budapest neighbor, Gábor T. Szántó, adapting Szántó’s short story. Veteran cinematographer Elemer Ragalyi (Jakob the Liar, An American Rhapsody) shot in gorgeous black-and-white, evoking classic films of the 1950s. One of the reasons 1945 is so compelling is your handling of suspense. Two Jewish strangers get off a train at a small village; their presence immediately generates shockwaves of fear and suspicion among the population. One of your influences was Fred Zinnemann’s High Noon, but 1945 also reminded me of some classic science fiction films from the Fifties, like The Day the Earth Stood Still (1951), in that the locals are so afraid of these aliens. Also, like thrillers by Hitchcock. Yes! [Like Shadow of a Doubt (1943), Strangers on a Train (1950), The Man Who Knew Too Much (1956)–each of which plays on the fear of outsiders.] Why do the villagers in 1945 feel so threatened about the otherness of these two Jews? Because this is a story about the collective paranoia that comes from the characters in the town being afraid of something about the past which they haven’t wanted to face. It operates on different levels for each of them, but they all have secrets, or degrees of guilt about what happened during the war. Because everyone in this fictional town was involved in some way, or benefitted in some way, from the deportation in 1944 of all their Jewish neighbors. How the state made non-Jewish Hungarians complicit in the destruction of the Jews started slowly. At first some discriminatory laws were passed during the late nineteenth century, but Jews who were part of the wealthier bourgeoisie in larger cities were safer than Jews who lived among poorer rural non-Jews. But when the Fascists came to power increasingly more severe anti-Jewish laws were enacted, and after the Nazis invaded in 1944, Jews were rounded up and shipped en masse out of the country in a very short period of time [by the Germans and Hungarian collaborators]. 1945 is a fictional story, of course. But every Hungarian family has its personal stories about the war, and what happened immediately after, and a lot of what happened had to do with money. In reality, partly to try to make the new peace last, the new government wanted to make the people more compliant—especially in the countryside, where there had been so much poverty and losses during the war. So, for example, the state put up for auction homes and property that had belonged to Jews, real estate and valuables which sold at deep discounts. Homes were bought up at a fraction of their original value. For many of the new buyers, who were given certificates of ownership, this was the first time their families ever had anything that nice. In our movie, the villagers are afraid they will lose it if the heirs of the deported Jews make claims to get it back. Which reminds me of that scene early in the film where the town’s clerk (Peter Rudolph) has this exchange with a policeman: “Jews have arrived.” “How many of them?” “Two. For now.” 1945 is definitely somber, but there’s some underlying dark humor as the movie unfolds, involving irony. It turns out that the two Jews have not come for revenge–but even if they had, they wouldn’t have had to do anything, because the village implodes all by itself. Yes, and only a few years forward in history the new regime would then go on to collectivize private property, also to appear to help those people—the poor and middle class–who had lost the most during the war. So, my cowriter Gábor T. Szántó and I felt it was really important to explore that brief period of time between the end of the war and the growth of Communist power, a time few Hungarians talk much about, and very few Hungarian movies before ours have covered. Peter Rudolf is terrific as Istvan, the town clerk or notary who basically runs the place, where almost everyone does his bidding. He plays a strongman type, a bully, which made me think of the political scene in some European countries today (and in the USA, for that matter) where there seems to be a nostalgia for strong men who’ll take charge of a nation and fix its problems, as if the citizens themselves don’t have a responsibility to be vigilant about the safeguarding of democracy. It can be a slippery slope from democracy to autocracy. Istvan is a type of guy long familiar to Europeans, whether we’re talking about Italy, Poland, Russia, you name it. In a patriarchal culture, where women have traditionally not had much say, he’s like mafia—a father figure with authority, like in The Godfather. Istvan’s a small godfather, a little Caesar, the fixer who’s always looking after his own interests first. We have had democratic elections in Hungary where the new governments kept their promises for about the first ten minutes, and then pretty much returned to the old ways. And the people accepted it because the old ways were what they were familiar with. But today some young Hungarians are taking an active interest in the health of democracy. I read Szántó’s short story “Homecoming,” from which 1945 is adapted, and was struck by changes between them. Of course you had to open the story up for the screen, adding material to allow a narrative of feature length, but you also brought some younger characters more to the forefront. There’s the young Orthodox man who arrives, and in the town there’s the shopkeeper who knows there’s a better life to be led elsewhere, and then his fiancée, and also her former lover who she’s not quite over. What was behind this decision? We expanded the story to include more characters so that we could create an entire village with different personalities who had different reasons to worry. But also in Hungary today we have the twenty-first century generation. My parents and grandparents can remember the time period of the movie, but the young twenty-first century generation doesn’t know much about it, and we really need to come together to concentrate on the property issue, because it’s so key to events that happened immediately after the war. And so with some of the younger characters the movie gets to show a young person’s point of view, and they help tell the story for us. By showing what they want for the future, I wanted to suggest that 1945 is not a closed story, but an open story. And that maybe the slippery town clerk [the shopkeeper’s father], the guy who always will know how to play whatever situation to his advantage under whatever new government he finds himself in, you could imagine maybe living today as some billionaire in Budapest. Oh wow, this is great, thank you for this.